In Detroit last week, Ford and VW announced a partnership to jointly build trucks and vans and to also pursue autonomous vehicle technologies together. The partnership makes sense from several standpoints. As they share technology development costs, they will also be jointly filling product gaps where neither company has a strong foothold. This simple example has a dynamic parallel for insurance. Behind the scenes for IT, technology development is often enabled by partnerships. And at the same time, business leverages channel and product partnerships to meet customer needs and growth demands. The key benefit of these diverse partnerships is that they not only allow the organization to save both time and money, but also to accelerate their growth and reach. Auto manufacturing, like insurance, is an industry built on networks. Just as it takes many component providers to build a car, it also takes a number of channel, service, data and technology companies to build, underwrite, sell and service insurance products. Insurance is a network-dependent industry. Unlike some industries, insurance’s premise started with networks, such as personal networks of financiers, friends, and fraternal groups. Agents and agencies grew into networks that would underpin the growth and reach of insurance companies. Flash-forward and insurance is more network-dependent than ever. From business processes and reinsurance, to data streams and cloud applications, networks continue to be critical to each insurance company’s strategy and value. These networks provide access to new capabilities, expertise, markets, products, services and more, to meet the demands and needs of customers, thus ensuring growth, profitability and relevance. Even as insurers become more comfortable with networks and partnerships, the sheer potential and complexity to integrate and manage them is an administrative, financial and time drain for insurers. This has led to the rise of scalable ecosystems. To grasp just how ecosystems can work to an insurer’s benefit, it is helpful to look at the types of networks and companies that are committed to bringing different insurance processes, models and products to the industry. These are the InsurTech startups that we find developing both within traditional insurance companies and outside of them. To solicit their views, Majesco, in cooperation with the Global Insurance Accelerator (GIA) and the Silicon Valley Insurance Accelerator (SVIA) recently completed a survey and an accompanying report, InsurTech: Energizing the Shift to Digital Insurance 2.0. The survey was given to two different sets of InsurTech leaders — Insurer/Reinsurer/MGA startups and Outside Solution/Data Provider startups. For our purposes, we’ll call these Insurer/MGAs and Solution Providers. In last week’s blog (Part 1), we used this report to consider InsurTech views on their focus and what they have learned. This week we’ll use the same report to look more closely at how InsurTechs’ value and traditional insurers’ needs will both be enhanced through the use of an ecosystem approach. We begin by revisiting InsurTech views on the insurance value chain. Which parts of the value chain have InsurTechs’ focus? 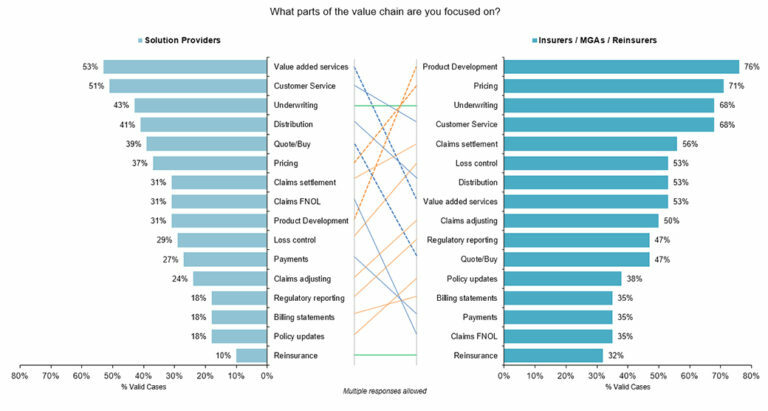 In Majesco’s survey, we found that Insurer/MGAs have a higher level of focus than Solution Providers across all parts of the value chain. In contrast, Solution Providers tend to have specialized products or services for specific value chain areas. We asked both groups about specific areas within the value chain. Solution Providers state their number one priority as Value Added Services — an area that is of strong interest to insurers’ customers, as we highlighted in our consumer and SMB research. Insurers/MGAs place their top priority on Product Development. If we take both of their opinions into consideration, internal operations will benefit from support to the front end of the value chain and forward-thinking insurers will benefit from the expanded services and channels fostered by the Solution Providers. Could the right kinds of ecosystems support both needs at the same time? We’ll look at this more in a moment. 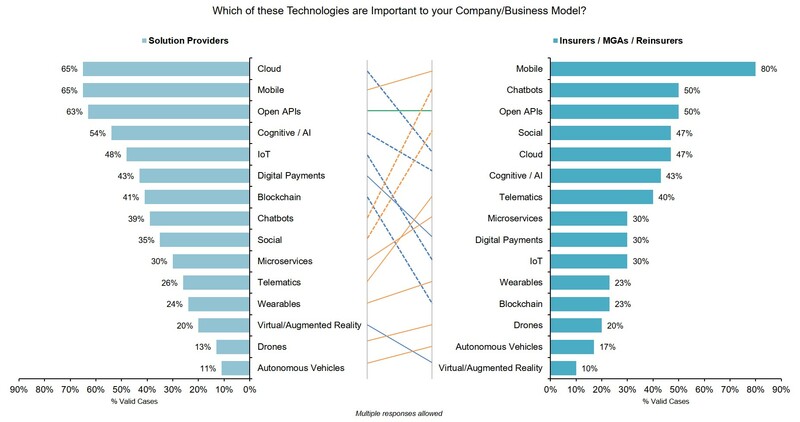 What technologies do InsurTechs consider to be important to their business models? Unlike the value chain focus areas, Solution Providers significantly outpace and lead Insurer/MGAs in the number and variety of technologies they consider important to their business models. On an absolute basis they are substantially-more engaged on 7 of 15 technologies, placing higher priority on Next Gen/ Platform technologies, such as Cloud, Cognitive/AI, IoT and Blockchain. In contrast, Insurer/MGAs’ focus is on point solutions for digital engagement like Mobile, Chatbots or Social (see Figure 2). The strong focus on open APIs by both segments highlights their recognition of the importance of the new “API economy” by creating true plug-and-play solutions that ease integration … delivering business value quicker and more cost effectively. APIs and digital solutions may sound like they are differing technologies with different ‘agendas,’ but the reality is that they are closely linked and would work well together in an ecosystem model. Consider how APIs and IoT are working so well together. Insurers that are prepared to receive data from telematic devices and stationary device sensors, are able to launch new products and work toward prevention of claims. Even technologies such as Cognitive/AI and digital payments can share relationships. Each of these multi-technology groupings is ripe for the consolidation and organization that can be found in an ecosystem offering. Once ecosystems of device sensors, AI and APIs have grown into ubiquitous use, insurers may wish to broaden their brand names to include the word security or protection. Solution Providers are correct to prioritize these areas and Insurer/MGAs should consider paying more attention to them in the near future. 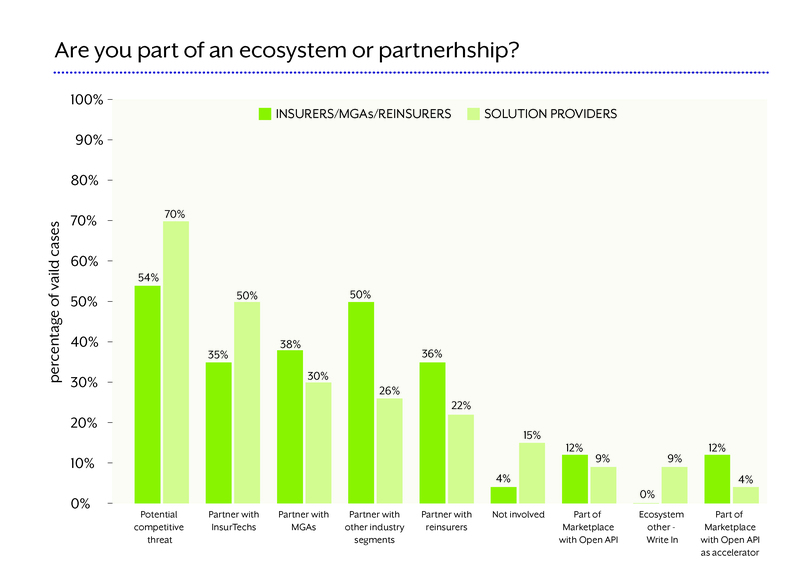 What is driving insurers and InsurTechs to seek ecosystems and partnerships? A key success factor in Digital Insurance 2.0 is the recognition that it is no longer desirable or optimal to “go it alone” in a rapidly growing “platform economy” where ecosystems provide a multiplier effect for growth. No individual company has all of the resources, time or capabilities required for success in this new era of insurance. Ecosystems accelerate the learning curve and adoption of new services and technologies. Partnerships that are part of ecosystems bring together the strengths of all participants (the whole is greater than the sum of its parts), but more importantly, partnerships create a powerful multiplier effect. While Insurer/MGAs and Solution Providers are both actively involved, the types of arrangements are quite different. Both segments are strongly focused in five areas, as shown in Figure 3. However, Insurer/ MGAs reflect a higher involvement with other industry segments and Reinsurers. In contrast, Solution Providers are significantly more engaged with incumbent insurers and other InsurTechs. These disparities are due to the focus of Insurer/MGAs on bringing innovative products and value chains to market and the Solution Providers’ focus of bringing innovative solutions to market. Insurer/MGA partnerships exist to support their market growth via financial backing through investment, providing the capital for underwriting business or reinsurance backing and for market and distribution expansion, particularly with other industry segments. Examples of this are Slice’s partnerships with incumbent insurers like L&G and XL Catlin, Lemonade with WeWork and Ladder with Sofi, or those working with Bold Penguin or Ask Kodiak to expand their distribution reach. In contrast, Solution Providers’ offerings are insurance-centric, focused on enabling Insurers (incumbents and startups). We are seeing these partnerships emerge and grow. Finally, despite the importance both InsurTech segments place on open APIs (noted above), very few are part of a marketplace where open APIs offer ease of choice and integration. They are, instead, continuing down a traditional path of point-to-point or accelerator integration via partnerships. 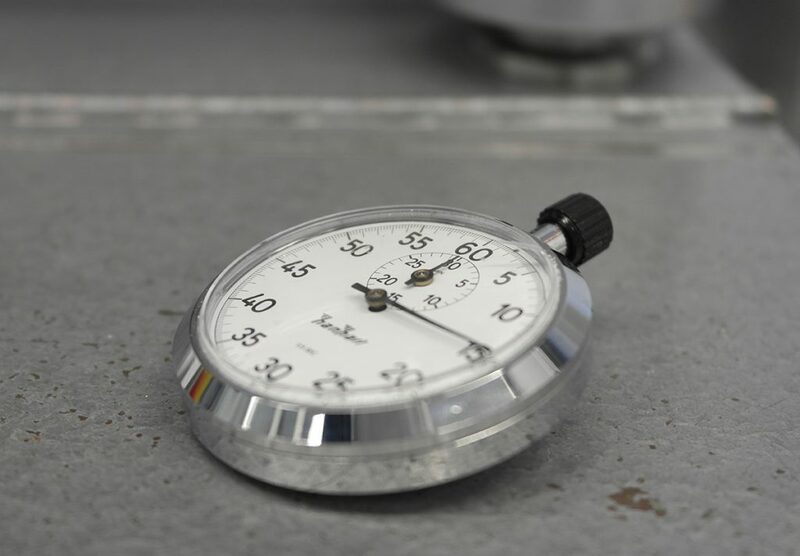 This approach is costly and will increasingly become a hindrance for innovation, speed and growth. Why will the ecosystem approach win over traditional one-on-one partnerships? Ecosystems are the future of every industry … including insurance. Why? Because they help the industry adapt, innovate and deliver new business models, products and process for insurance. They are a natural outgrowth of the conflict between complexity and the need for quick implementation. In the same way that it is impossible to focus on every bird in a flock of birds, insurers need the ability to focus on only the right technologies, services, markets, data streams and relationships they need. If a pre-built ecosystem provider has identified a robust selection of the best API-based apps and made them available in a marketplace that you subscribe to on demand, rather than as a code repository that requires greater integration effort, then an insurer can have the best of both worlds. They can possess the most valuable new technologies, data sources, services, channels and more without the multiplication of complex relationships, time and costs. They can use an ecosystem’s selection to focus on customer demands and growth. As we mentioned in our last blog, we anticipated this potential challenge as we began working with InsurTechs in 2015. 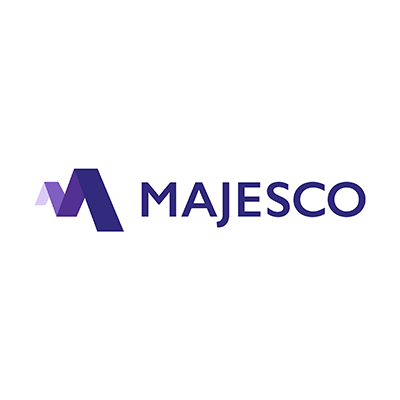 This led to the development of Majesco Digital1st Insurance™, designed and built as a microservices-based, multitenant cloud-native platform with the ability to subscribe to third-party services and real-time data sources that traditional core systems cannot effectively support. One of the components, a next generation partner ecosystem hub, Majesco Digital1st EcoExchange, offers an open set of curated third-party services with a standard semantic layer for easy integration and a true “plug-and-play” environment for both traditional and InsurTech partners. Its app store interface makes it simple to quickly identify and begin using services as needs are identified. The results are clear. Growth-ready companies are assisted in their quest for Digital Insurance 2.0 by preparing themselves for easy, plug and play integrations of cutting-edge technologies, services, capabilities and data streams. Utilizing an ecosystem approach to acquisition is the efficient and effective way to quickly get what they need. For more information on InsurTechs and their roles within insurance, be sure to download InsurTech: Energizing the Shift to Digital Insurance 2.0. Then, for more information on today’s most viable insurance models, read Majesco’s new thought-leadership report, A New Business Model for a New Era of Insurance.